Sam Lowes says that Sunday’s Dutch TT was an important race for him despite crashing out of the battle for points at the Assen circuit, with the opportunity to dice with opponents helpful for the rookie as he continues on the learning curve in the premiere class. Making the most of an impressive top ten qualifying performance, Lowes was able to mix with the likes of Loris Baz and Jorge Lorenzo in the early stages of the race before his fall brought it to a premature end – and says he took a lot away from the experience. "It was a difficult race for everyone. We had ridden on the dry track only on Friday and the track changed completely. I was in a good group. When Lorenzo overtook me I felt like I could stay with him and set my sights on a good position. I battled a bit with Baz, and I was faster than him in some situations, but we overtook one another on practically every lap. “I crashed as I was opening up the throttle, and maybe I was a bit too close to the white line and the damp patches at the side of the track. But this weekend I definitely took a step forward. I’m pleased that there will be a race in a few days because we are on a positive trend." However, teammate Aleix Espargaró was left somewhat more frustrated by his own top ten finish, after admitting after the rain-struck race that his Aprilia didn’t perform the way he expected on the damp but not wet surface. "I cannot be entirely satisfied because our goal is still to be closer to the leaders. The race had started well. I managed the first part, successfully overtaking a lot of riders and maintaining a good pace. A few laps before the rain I had begun to visibly recover ground. The RS-GP was really working well and I was closing the gap quickly. 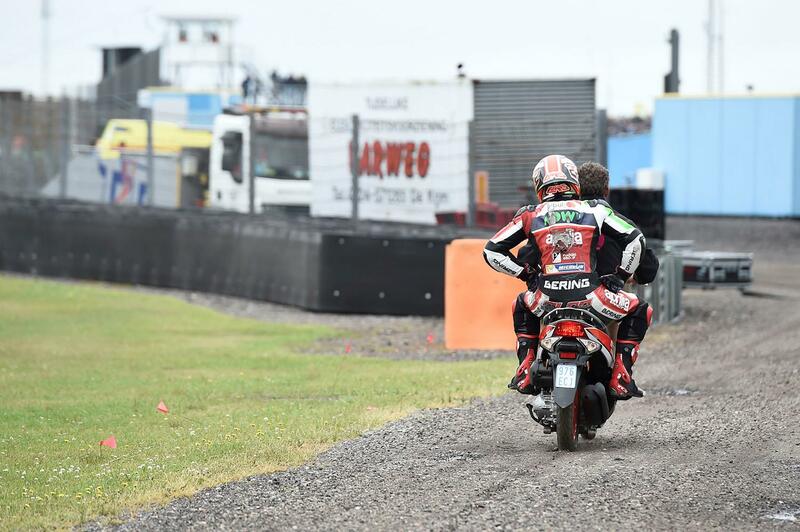 “Unfortunately, I did not have a good feeling on the damp track and I was unable to push. Today we demonstrated once again that we can be very competitive, but the weather got in the way."